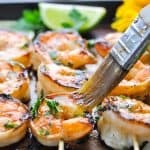 A simple Marinated Grilled Shrimp recipe is the perfect easy and healthy dinner for warm weather months! 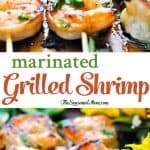 A simple Marinated Grilled Shrimp recipe is the perfect easy and healthy dinner for warm weather months! With just 10 minutes of prep and 5 minutes on the grill, this fresh dish comes together quickly and makes family meals relaxing, delicious, and nutritious! In your mind, what qualifies something as a “feel good” food? Is it the combination of fresh ingredients, the memories associated with a certain meal, or the friends that joined you around the table? So often we are told that we should only nourish our bodies with whole, real, “clean” ingredients. That we should avoid entire food groups like carbs, gluten, dairy, or sugar. And while it’s obviously important to fuel our bodies properly, eliminating entire food groups can mean missing out on a truly beautiful and satisfying experience that does much more than slim a thigh or build a muscle. Over the years I have come to appreciate the recipes and foods that truly make me feel good. My mom’s Spaghetti with Meat Sauce or Beef Stew; Aunt Bee’s Swedish Meatballs; or a Snickers ice cream cone from our favorite candy shop on the Vineyard. These are the dishes that conjure up fond memories, bring joy to the table, and make me feel satisfied in mind, body, and spirit. They’re not checking a specific macro nutrient box, but instead nourishing my soul in ways that a kale salad never will. There are also those “feel good foods” that are a happy combination of comfort, nutrition, and ease. 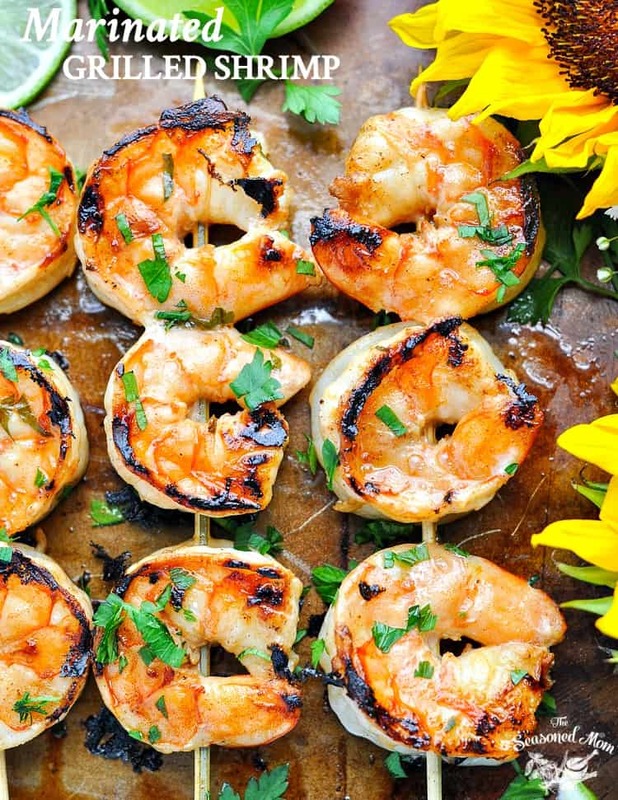 For me, a grilled shrimp kabob immediately takes me back to the summer dinners of my childhood. My mom regularly served grilled shrimp with a French baguette and a fresh green salad. It’s simple food that nourishes our physical bodies, but that also reminds me of warm summer evenings, carefree nights on the deck, and a table full of loved ones. High-protein, low-carb, and gluten-free stats are irrelevant. The food is so much more powerful than any numbers on a panel or any single stand-alone ingredients! Grilled shrimp have now become a staple at my own family’s dinner table, and regular readers probably know that I’m constantly coming up with new and interesting ways to prepare them. This marinade was a huge hit with all of my boys, it’s made with simple and fresh ingredients, and the end result is a wholesome, feel good meal that you can enjoy sharing with loved ones. No matter how healthy or how indulgent your “feel good foods” may be, I hope that you’ll treat yourself to the joy of nourishing all aspects of your mind, body, and spirit with the recipes and memories that are uniquely special to you. In a jar with a lid, combine all of the marinade ingredients. Shake until completely combined. Place shrimp in a large zip-top bag. Pour the marinade in the bag with the shrimp. Seal the top of the bag and place shrimp in the refrigerator to marinate for at least 20 minutes (but not more than 2 or 3 hours). Remove shrimp from the bag and discard the marinade. Thread shrimp onto skewers and grill over high heat for 4-6 minutes, or until done. If you prefer, you can also broil the shrimp on a sheet pan in the oven for about 7-8 minutes. Garnish with fresh lime wedges and additional chopped parsley. Shrimp is definitely a feel good food for me! It’s seafood, which I feel is naturally healthier, and SO delicious! 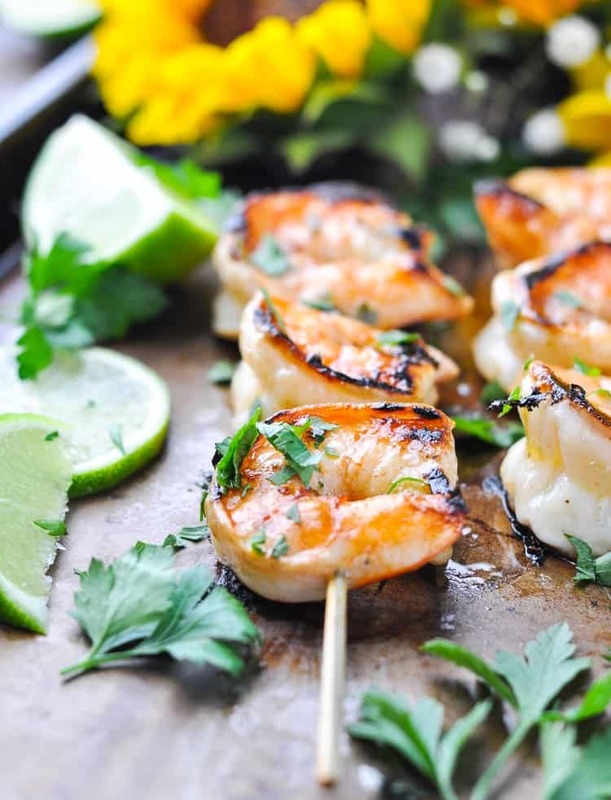 I love grilling shrimp, especially in the summer, and this marinated version looks SO good, Blair! Pinning to try! Thanks so much, Gayle! Shrimp is such a staple in our house at this time of year. So fast, easy, and healthy! Thanks for the pin! Great recipe. We substitute lemon for lime simply because we always have lemons​ in the house..
My favorite summer food is boiled crabs with hard crusted bread. Favorite cold weather foods are Portuguese roast and kale soup (not in one meal). This recipe is AWESOME!!! I decided to give it a try couple days ago. I used the largest shrimp I could find, replaced the tomato sauce with chili sauce, upped the cayenne pepper, marinated them for two hours and then grilled. People were raving about them.Thanks so much for this recipe!!! Excellent! So glad that they were a hit! My 3-year-old son requested them again for dinner last night, so they’re definitely a favorite around here, too. Your changes sound delicious as well! looks wonderful however did not give any directions after marinade….. I found your site & this recipe via Skinny Taste. Even though it is October here in Ohio, the weather is still warm enough that this grilled shrimp recipe can be a last salute to summer. The accompanying photograph is lovely. I am looking forward to checking out more of your recipes! Hi, Linda! I’m so glad that you found the blog! 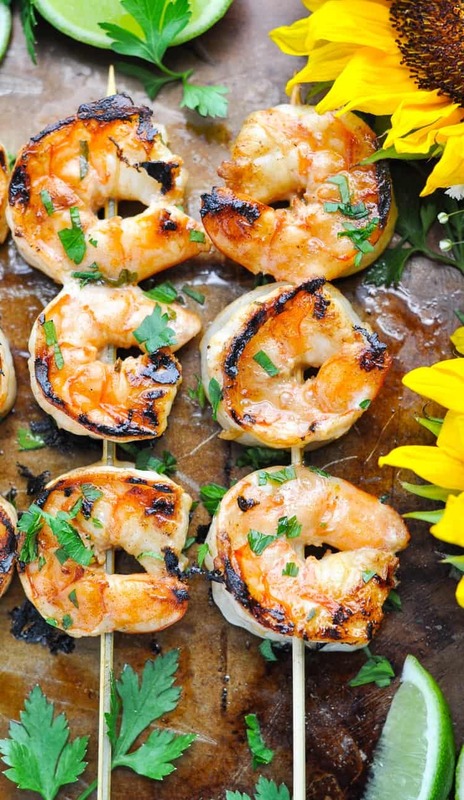 This grilled shrimp is one of our go-to family favorites (especially in the summer)! I hope that you love it too! I read that some one changed the tomato sauce for chili sauce and added cayenne pepper but i don’t see anything in the recipe with these items. Awesome, Angela! I hope that you enjoy it! Hi, Ann! Yes, you can definitely use frozen shrimp (that’s often what I do). Just thaw them before cooking. You can either thaw the shrimp in the refrigerator overnight, or run them under cold water in a colander for about 5-7 minutes if you’re pressed for time! 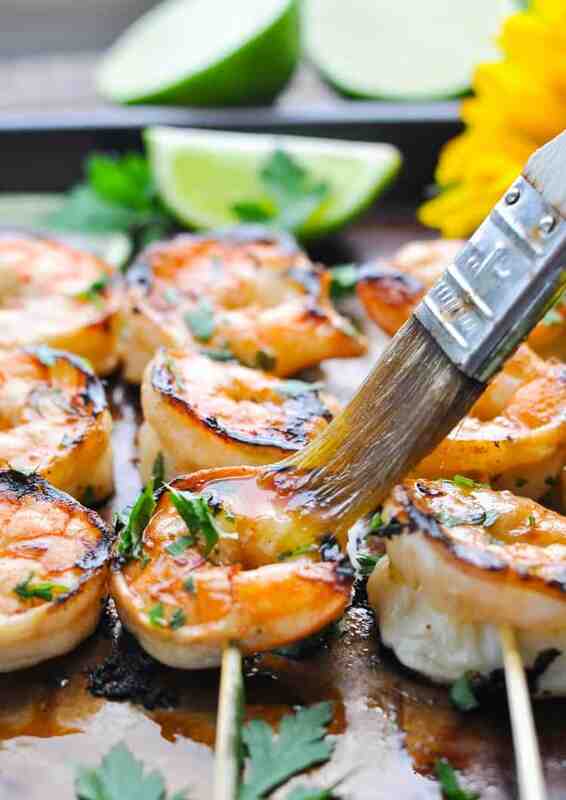 Your marinated grilled shrimp recipe is stored in my memory bank. I have made this easy wholesome recipe many times and it is always a crowd pleaser. I give you Five Large Stars Thank you! That’s wonderful, Albert! It’s definitely a staple in our summer meal rotation as well. So glad that you like it! Made this a couple of months ago and thought it was OK, but then realized in my rush that I neglected to include the garlic and salt and pepper! Finally got around to making it again yesterday, following the ingredient list and only adding a little bit of red pepper flakes. Marinated for about 45 minutes. It was fantastic! Very easy and quick to put together–like most of your recipes. My husband cooked them on the grill top saute pan (the one with the holes in it). We used the lovely U15 easy peel fresh shrimp from Costco, which is a perfect size for this since they stay moist and very flavorful. Thanks for a keeper recipe! Great recipe my family and guest Absolutely loved these marinated shrimp. I love your approach to food. I feel that the restrictive fad diets of cutting entire food groups are myopic in the extreme. My mom also had the same approach to food – good wholesome food that made you happy for that particular occasion, season or reason. Will be trying this soon! And bookmarking your website to come back to! Big hit with the fam and so easy to put together. Thank you for an awesome recipe!! Thanks, Julie! I’m so happy to hear that! It would be nice if there was some way to print the recipe. What would be the downfall to marinating the shrimp for say 10 hours as opposed to the max 2 or 3 you say?